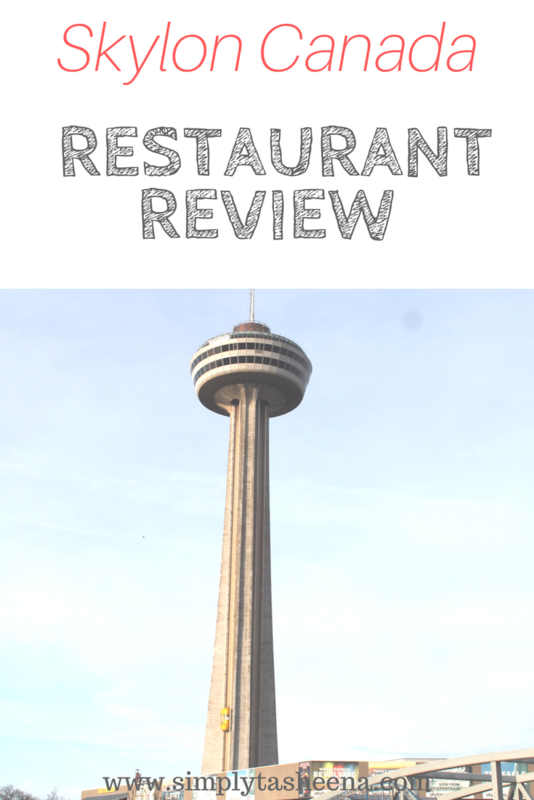 One of my friends mentioned to me how they went to the Skylon restaurant so I thought that I would check it out while we were visiting. I knew it wasn't too far from our hotel based on what Mapquest presented. However, I wasn't sure. I was pleasantly surprised upon arriving that the restaurant was within walking distance from our hotel. I purchased a voucher on Groupon which stated that we had to make a reservation 24 hours prior. I made our reservation online. The Groupon also included a ride to the restaurant and the observation deck as well. Upon entering the building we actually had to check in first and then we received our tickets to get on the elevator. The line moved pretty fast. I made our reservation for around 6:00 pm because I wanted to ensure that we would have a daylight view of the restaurant. Once we arrived at the restaurant I requested a table near a window. I believe all of the smaller parties have a window view. Not sure about the larger parties. We were seated and our waiter was super nice. We ordered an app. During that time I took plenty of pictures. It's so weird because it is a small restaurant and you really can't put anything on the edge because restaurant moves. The shrimp cocktail was delicious. Our food did take some time. Nothing out of the ordinary though. During that time I would just take pictures. When our food arrived I was so surprised at the portion size. Michael had steak and I opted to get the seafood pasta which was yummy. I had really good size seafood pieces which were awesome. Michael loved his steak as well. Our waiter was very attentive and always made sure we were fine. We opted not to get dessert because I was stuffed and I'm also on a weight loss journey. Would I recommend this restaurant? Yes! The views are breathtaking and the food is delicious. Wow, amazing! I'd love to eat here. The food looks delicious too. I want one of those fries! What an amazing view!!! The food looks delicious as well! I will have to keep this restaurant in mind when I go back to Canada because I would love to try it out. Thanks for sharing! Your pictures are great and the restaurant looks like its a must-do on a trip to Niagra. Thanks for the tip! Amazing view and this place seems to be so awesome. Those views look incredible. And the food looks amazing as well. If I'm ever in the area, I hope to make a visit! The food looks spectacular and add the views to it and it's simple perfection. I will have to go and check this out when I can. Very cool! This is the rotating restaurant, correct? I love that the offer Groupons! That's so awesome! The views are amazing and the food looks delicious. The food and the view looks fantastic. I am sure you had a great time over there. Aww that view is amazing, and the food looks so good. Great review. Wow, looks pretty awesome, I must admit. I'll have to add it to the list for when I'm back in the Great White North!